The subject of today’s post is one of the few reasons why I love living in Los Angeles, where Persian stores are abundant and Persian groceries are easy to obtain. I am a lover of all types of citrus. I fell in love with Sweet Persian Lemons many moons ago. I always look forward to when they are available at my local Persian Store. 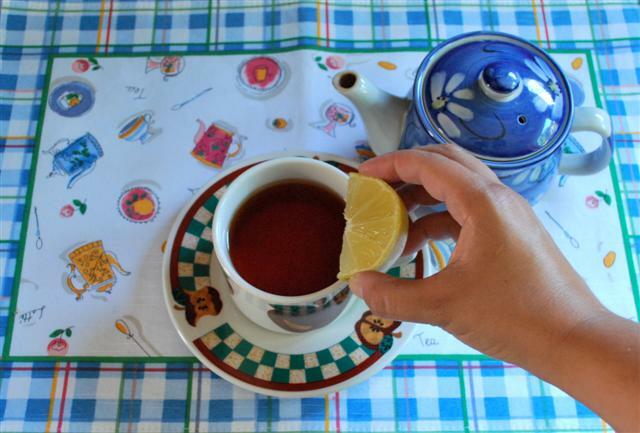 One of the many food memories that I have from Iran is Persian tea being served with these lemons. Every time I cut them and smell their delicate scent I go right back to my childhood. Look how gorgeous they are. Persian Sweet Lemons usually have a very thin rind and always have seeds. 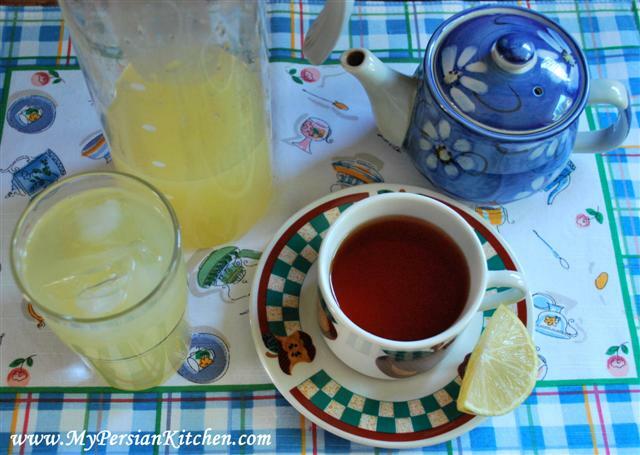 You can brew some delicious Persian Tea and serve it with a slice of Sweet Persian Lemon. You then squeeze it in your tea. It will add a nice sweet scent and flavor to your tea. I personally love to juice them and drink them up. 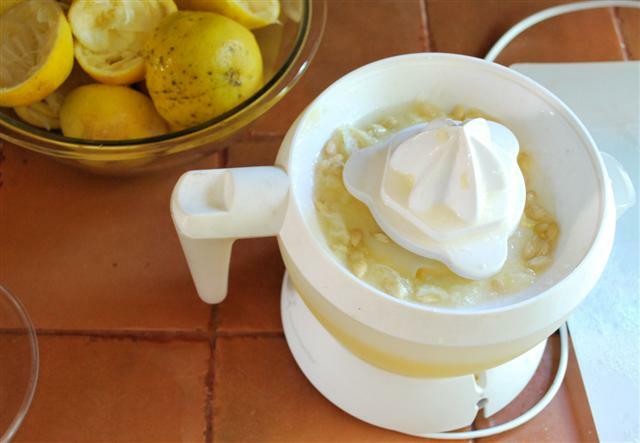 All you need, preferably, is a juicer to make the whole process nice and easy. I love these types of juicers. They are simple and remind me of the one my mom used back in the 70s when I as kid in Iran. 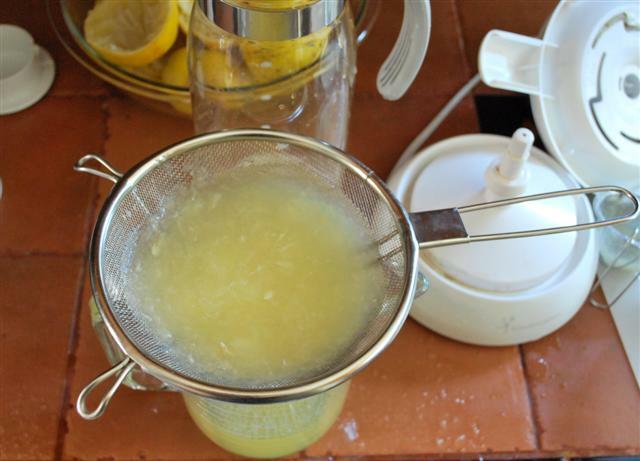 Once you are done juicing the lemons, I highly suggest straining the juice. Throw in a couple of ice cubes if you like and drink it just like that. You will notice that there is no need to add sugar because the juice is sweet on its own. It has a very sweet scent to it which will totally flirt with your nose! Interestingly, if you leave some of the juice to drink later, its flavor changes. It becomes a bit bitter. If you like grapefruit juice, then you won’t mind. I like them either way, but there is nothing like drinking the juice when freshly squeezed. Sweet Persian Lemons are very popular amongst the Iranians, I highly suggest you try them out. Your life won’t be the same!!! One arm of my Citrus Salad Tree is Persian Lime and there are four other fruits. P.S. A dear dear friend on mine is engaged to a Persian man, I am so happy for her. The wedding is in the Spring. Hello, I think this is my first time posting? I have been looking and looking for a recipe I had once, and I think it may be the one you have in your header (where you flip the pot over when finished and you are left with a crusted potato)? Why thank you Lori Lynn! I had never heard of such type of tree. That is awesome. I would love to meet you! 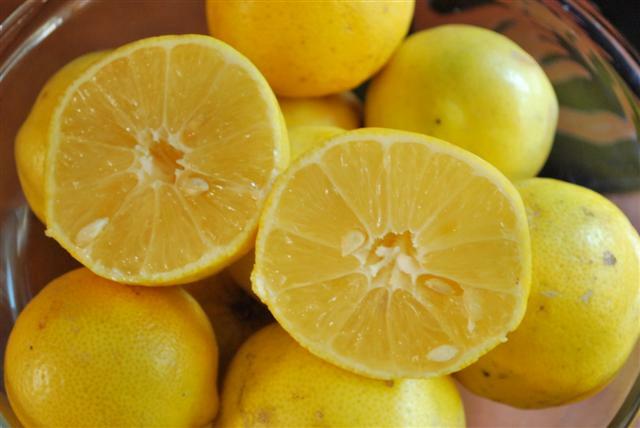 Our lime and orange tree need to be planted….long story…but our regular lemon tree gives plenty of lemons. EI have exactly one grapefruit growing! We also have a loquat and a guava tree. I don’t know what to do with either one of those. Do you know if your friedns are going to have a Persian Ceremony? April Marie, thanks for leaving a comment. Actually the rice on the header is a sweet rice toped with almonds and pistachios. I am going to post the recipe for the type of crust that you mentioned soon. Stay tuned! Thanks for the kind words Nora! The good thing about these lemons is the fact that there is no sugar needed!!! I got one from my Persian friend and it was really lovely. Suprisingly not at all tart! Yes! Not tart at all. Just sweet and fragrant! Could you make some suggestions for types of tea and preparation methods? There are so many choices, as a result I either prepare it wrong or I am choosing the wrong blend of tea. In my opinion after eating Persian food (for me this usually means over eating), nothing beats a steaming cup of Persian tea. Thank you for mentioning my Blog as well. 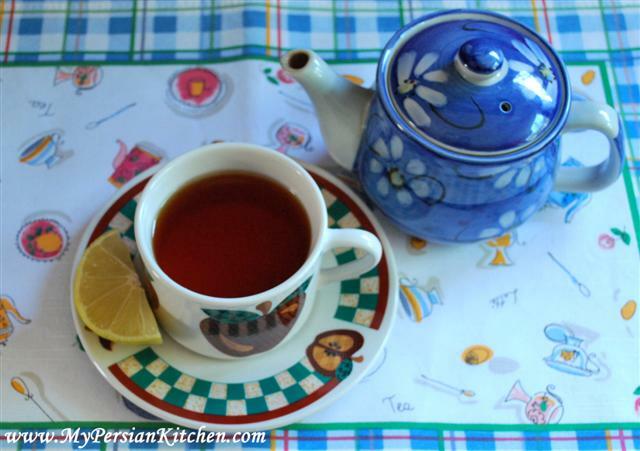 yes, indeed I will be posting about Persian tea preparation. I completely agree, there is nothing better than a cup of hot Persian tea after a meal! hi, i love ur blog. im not iranian but i have lived in iran as a little girl and i used to be able to speak persian so i have always felt this connection with iran. not to mention i love the food! you made my mouth water so much with this post – i wanted to ask u – are these lemons the same as – ”Meyer Lemons”? these also have a very thin rind, have seeds and have this AMAZING sweet smell that just wafts up to you. i just bought some today and immediately thought of you…but i wonder if they are the same as persian lemons? Sum, thank you for your kind comment. To be honest, I don’t think I have ever had Meyer lemons. I have to do my homework on this question and get back to you! 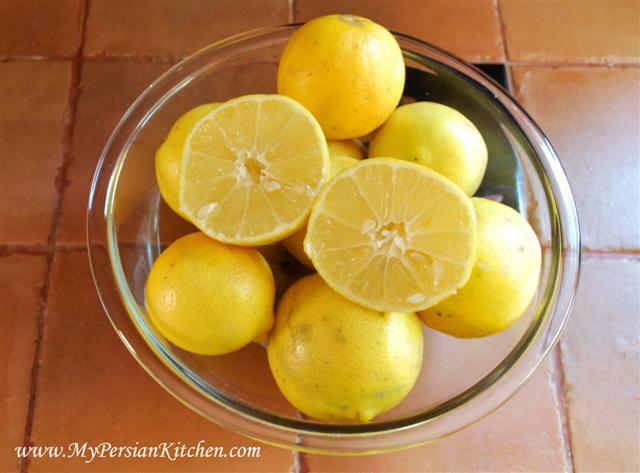 love persian sweet lemons…transport me right back to my childhood. Do you know the history behind them? are they a product of nature or were they mutated centuries ago? Raana, good question, I have no idea. I will do some digging and get back to you about it! I wonder if these are the same as what’s called a lemonade fruit in Australia? I don’t find them particularly sweet but they’re much less sour than regular lemons and you can peel and eat them like an orange. My mum often gives me some from her tree, and the looks I get when I eat them in the tea room at work are just priceless. Katie, these lemons are definitely not sour. They are on the mild sweet side and have an amazing smell! i live in northen jersey were i can find persian lemon ,store or market. Does the Store in Woodland Hills sell this? DELICIOUS. Lemons are DELICIOUS. Thought you might know where i can purchase in San Fernando Valley. @ Kathleen, there are a few Persian stores in the valley that have these lemons! 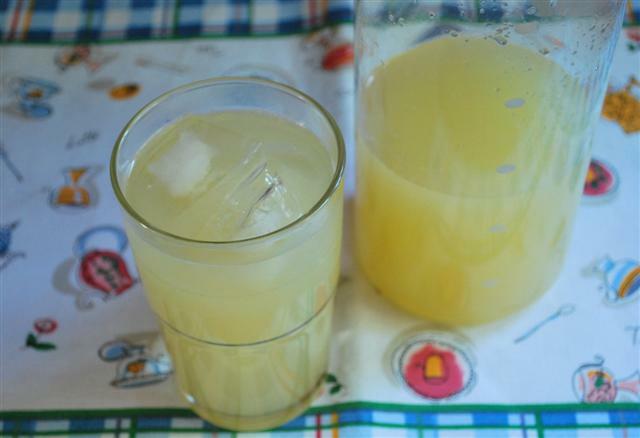 I remember when I went to Iran about 8 years ago (I was 10) over the summer, all the houses we would go visit would serve this peculiar lemonade that was amazing. I haven’t had it since then, and now I know what was used to make it! Thank You! By any chance does anyone know where I can find these in Melbourne, Australia?i miss eating these in cold winter days so much!! 10 years ago, gardeners planted our requested lemon, lime and orange trees. The lime died, but the orange and lemon trees produced lots of fruit. Imagine my disappointment when I harvested the lemons and discovered their lack of acidity. I thought it must be some genetic fault. Each year, I tested the fruit to see if sourness had developed. Today, I did my annual test and decided to eat a few sections. Putting aside sour expectations, I tasted a sweet and aromatic fruit. Decided to google “sweet lemons,” discovered this article and now realize I have a treasure. Thank you! I will be sampling it in new ways. Well I’m Iranian and I also live in Iran. I should say that we do not mix sweet lemon juice n tea but we mix lime juice n tea.